Outward Bound is not merely a sequence of adventures in wild and beautiful places. It is a form of learning that brings people together in highly energized sequences of challenge, cooperation, and service. Outward Bound is designed to bring out the best in people through active learning, so that they will strive for a better life and defend human decency with all their will. Nothing could make more sense for New York City than to unleash such a form of learning . . .
NYC Outward Bound Schools was founded in 1987 to bring Outward Bound’s powerful educational approach to New York City’s young people and their public schools. In 1986, a group of Outward Bound enthusiasts, frustrated by the enormous number of New York City students receiving an inadequate education, petitioned for a charter from Outward Bound USA to operate Outward Bound programs in New York City. At the time, fewer than half the city’s public school students graduated on-time and many of those who did graduate were poorly prepared to succeed after high school. Based on their own experience with Outward Bound, our founders knew that it offered a powerful antidote to our city’s educational ills. They understood that the lessons of Outward Bound transcend place: this highly adaptable, dynamic way of teaching and learning is as relevant and powerful in public schools as in the mountains, if not more so. They saw that if the transformational power of Outward Bound’s approach could be unleashed to change the trajectories of our City’s young people, students would graduate with the foundation of skills, knowledge, habits of mind, and qualities of character they would need for success in school, careers, and citizenship. 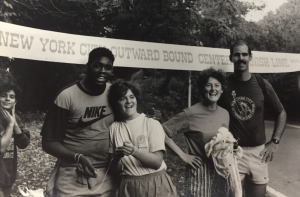 Outward Bound approved the petition in 1987, making NYC Outward Bound Schools the first independent Outward Bound urban center in the country. 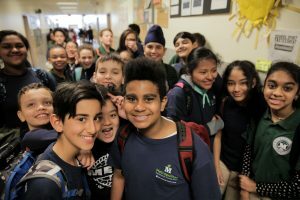 Since our founding, we’ve continually adapted to be responsive to the changing needs and circumstances of New York City’s students and to best leverage opportunities to transform schools and change lives. During the past three decades, we’ve evolved from an organization whose sole focus was on providing programs to students in schools to one that brings Outward Bound’s approach and activities to NYC’s young people and their public schools in multiple ways. Today, we operate a highly successful citywide network of public schools that are built upon our approach. And we are bringing elements of our approach and best practices from our network to a growing number of other public schools in NYC through our Adventure & Team Building programs and Select Strategies professional learning services.